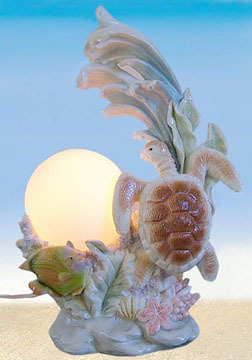 Our artists capture the spirit of the sea and bring ocean collections out of the sea and into our homes with this beautiful Sea Turtle Globe Accent Lamp. This exclusive artwork will brighten up your living corners with ever enchanting charm and inspiration. The detail and craftsmanship are unparalleled. It also makes a great night light and an exquisite accent lamp for your home or office.